Here’s why it’s NOT game over for Tencent. MUST READ! The global market for video games has expanded rapidly over the past decade spurred by advances in mobile connectivity and smartphone technology. 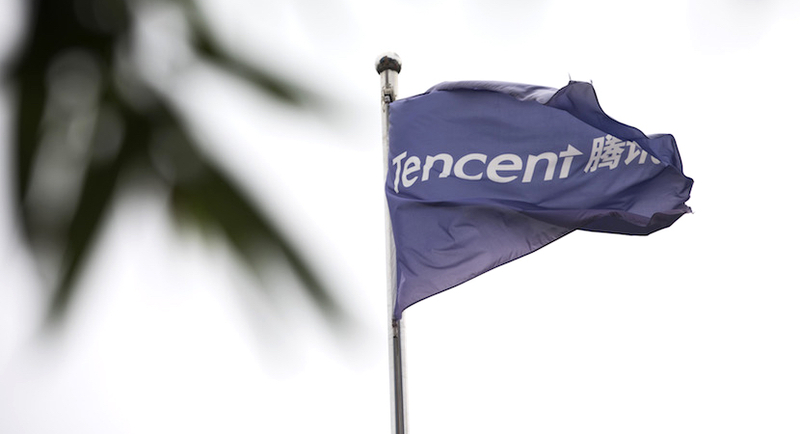 The size of the industry is estimated to be USD 140 bn and has allowed Naspers, through its investment in leading game company Tencent, to become the largest company on the JSE. Recently, both stocks were sold down severely by the market amidst a weak second quarter result in Tencent’s gaming business. The weakness was driven by a clampdown on video games by Chinese regulators. This prompted many to ask whether the result marks the end of an impressive growth story. An escalating trade war between the US and China adds further fuel to these concerns. This report asks whether it really is “Game Over” by shedding light on the game industry in China and Tencent’s prospects going forward. The year 2018 has been a turbulent one for Tencent as demonstrated by its share price which has fallen 23% in the year and 34% from its peak in USD terms. Naspers, the largest stock on the JSE through its 31% interest in Tencent, has followed suit falling 29% in the year and 26% from its peak in US Dollar terms (as at 6 Sep, 2018). By virtue of being c. 20% of the All Share Index, Naspers is a mainstay in many retirement portfolios and significantly influences the retirement savings of most South Africans. Furthermore, Naspers and Tencent together represent more than 6% of the MSCI Emerging Markets index. The sharp fall in stock price was due to a rare earnings miss by Tencent – its first in nearly 13 years. As shown below, earnings per share fell 2% YoY and 23% QoQ despite revenue growing 30% YoY (Figure 2). The weakness came from its video game business which is facing increasing Government scrutiny in China. A sector wide freeze in awarding licenses for new games has been in place since March due to the restructure of a regulatory body. Authorities are further seeking to limit the number of hours minors spend playing games and limit the total number of games operating in the market. The crackdown has severely affected Tencent’s hit game, PlayerUnknowns’ Battleground (PUBG), which could not be monetised despite topping the charts in terms of number of active game players. 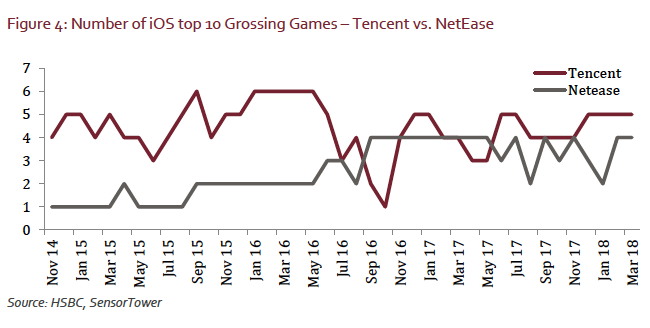 Despite the regulatory pressure, Tencent’s operating metrics within its gaming business appear to be stronger than ever. 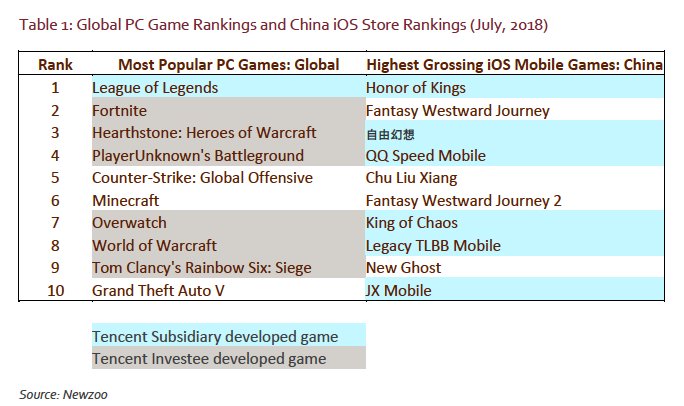 It is well represented in the top 10 rankings both globally across Personal Computer (“PC”) games and locally within the Chinese Appstore (see Table 1). Engagement within its games measured by monthly active users has been growing at double digits. The only pressure point has been that monetisation per user has declined due to a delay in obtaining regulatory permits. The key question is whether the industry profit pool of Tencent’s most profitable segment, video games, will structurally decline from here on due to the escalating regulatory pressure. If so, it will indeed be “game over”, especially with the high expectations placed on Tencent at a 33x PE multiple. In the sections that follow, we provide a brief primer of the Chinese game industry and share our perspective on how recent developments will affect Tencent’s future prospects. Investing in video games, really? Clients often express a degree of disbelief when we explain to them that a company which generates the majority of its revenue stream from video games is also the biggest constituent of the JSE and a sizable holding in our fund. On one occasion, a client even remarked: “But gaming is so fickle” and another could not understand how such companies make money, let alone achieve a larger market cap than global juggernauts such as British American Tobacco and Coca Cola. 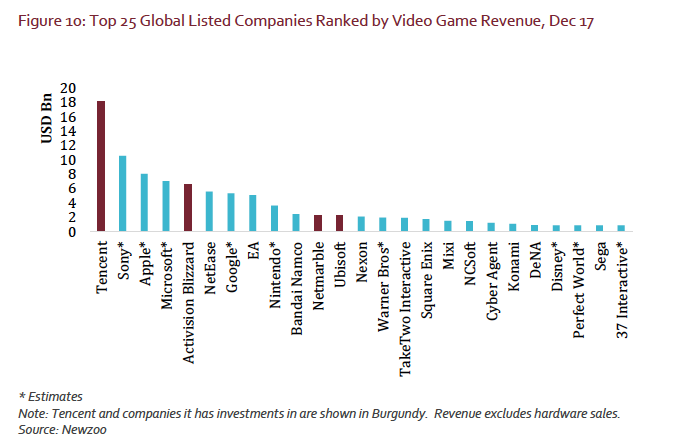 However, video games are indeed a significant business. Globally, the industry is worth c. $140bn and is one of the fastest growing categories in the $2 trillion media and entertainment industry (see Figure 3). It has already overtaken the movie industry ($41bn), radio industry (c. $52bn) and recorded music industry ($17bn) in size. 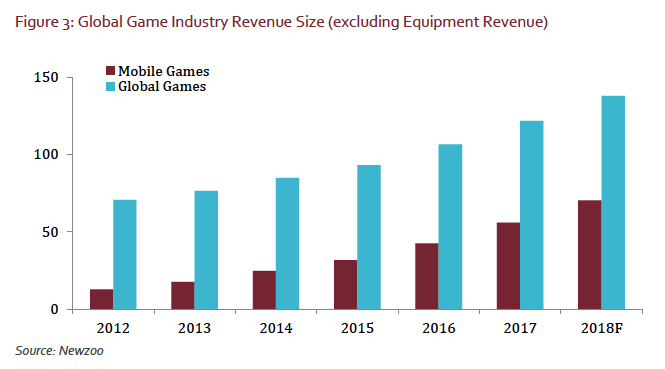 Mobile games account for much of this growth and represents approximately half of the game industry’s revenue. 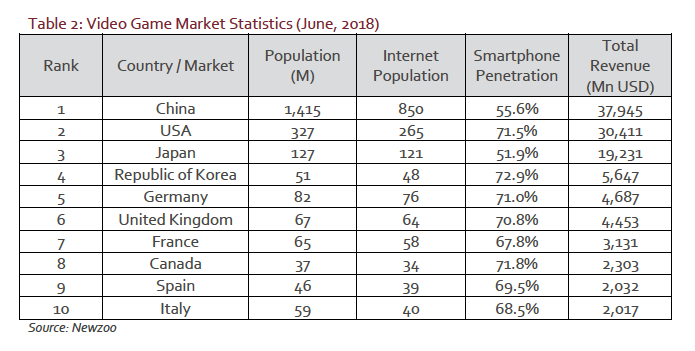 Rising smartphone penetration has expanded the addressable market to a broader demographic far in excess of the legacy PC and console game market. Today, games are played across more age groups, sexes, nationalities and income groups than ever in the history. The gaming population has expanded to c. 2b people which is its highest point in the industry’s history. As shown in Table 2, China is the biggest market in the world and the most attractive for game developers. It is bigger than the US in terms of size, growth rates and number of gamers. The Chinese game population with 620 million players is bigger than many countries in the world and spends $38bn on games. It is expected to continue growing due to the low smartphone penetration in country. Roughly 70% of spend on games in China is allocated towards locally developed games making the country one of the most insular markets in the world. This is, in part, because foreign developers are required by law to utilise a local publisher to distribute their games in country. Within this context, companies such as Tencent and NetEase have built thriving enterprises by developing their own content and also playing the role of distributor for foreign game developers. The dominance is demonstrated by both the consistency with which they produce top 10 hit games (Figure 4), and their combined market share of c. 66% of the industry’s revenue (Figure 5). Furthermore, this share has been increasing which implies that larger players are consolidating the overall market into a duopoly. Such consistent market dominance is rarely possible without a strong competitive advantage over competitors. 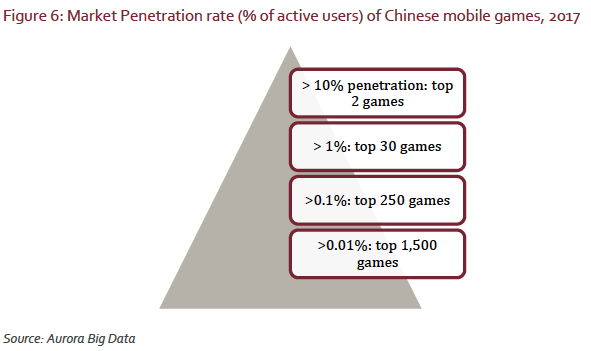 To understand the drivers of this economic moat, one has to appreciate first that the majority of games in China are played online (mobile and PC). Console games never really penetrated the Chinese market as they were banned until 2014 and are highly prone to software piracy. As a result, online games became popular as a means of avoiding piracy. This resulted in a wide proliferation of free-to-play or freemium games where monetisation takes place by purchasing items within the game (e.g., customisations, weapons, etc.). Interestingly, this model has more recently gained popularity in other parts of the world due to the rise of multiplayer gaming and mobile appstores. The left hand side of the equation is driven by the duration over which a game can retain a player’s attention. Long-standing games are extremely profitable due to monetisation which can last for many years. For example, Dungeon and Fighter Online created by Nexon (Japanese company) and operated by Tencent in China have generated lifetime revenues of USD 10b over a period of approximately 10 years. It also means that new users do not need to be acquired each year, reducing cost per install and increasing its operating margin to 93%. Under such a model, profits from the video game become an annuity stream instead of a one hit wonder that quickly fades away. A common mistake made by game publishers is to focus on user acquisition instead of lifetime value. Ratcheting up marketing spend too hard upon launch may assist in achieving a high appstore ranking only to find that, very quickly, the user migrates to the next big thing. Without retention, revenue generation over the lifetime of the customer may never exceed cost per install resulting in poor profitability. Commercially successful games prioritise extending the life of the game through user engagement more than its promotion. This difficulty of maximising the above equation lies in the fact that only a small percentage (<15%) of players are willing to pay for in-game items and effectively subsidise the remainder of the user base. These users, who drive monetisation, focus their attention on a small number of titles. Research shows that the average user installs only 3 or 4 games on their device at a time. Of these, it is most likely that two of these games will be amongst the highest-ranking game in the respective appstore (see Figure 6). As shown, the top2 games have 10%+ market penetration rate. These rates fall very quickly for the next highest ranked games. Tencent holds a number of competitive advantages in this regard which cannot be matched by the competition. These are summarised in Figure 7 below. Of these, ownership of the largest in-country social networking assets and priority access to gaming communities contribute the most to its superior industry position. WeChat2 alone has a user base of over 1b people in China. The implicit network effect within a walled garden protects it from formidable competitors such Alibaba who have tried to replicate this asset in the past. 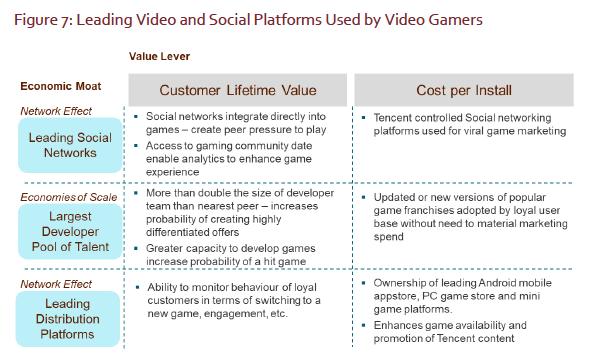 Having access to live social media datasets that accounts for more than half of internet user time spent online creates an information advantage which enables Tencent to continually enhance game design post launch to match it to evolving user experiences. These advantages translate into high levels of engagement as demonstrated by the above average longevity of their games. Dungeon and Fighter and League of Legends are both celebrating their 10th Anniversary this year. The extent of Tencent’s social networking footprint is shown in Figure 8 below. Enhancing customer lifetime value by increasing the lifespan of a game requires understanding of the psychology behind video games. Great games have the ability to create a deeply pleasurable experience of heightened focus resulting in a trancelike state of immersion in the activity (addiction). In the context of gaming, this is the cause of players losing themselves in a game for hours on end without any awareness of time (being “in the zone”). The concept was originally studied by psychologist Mihály Csíkszentmihályi when observing artists, musicians and chess players to explain drivers of happiness. He realised that people were at their most creative, productive and happiest when they were in a state her termed “flow”. 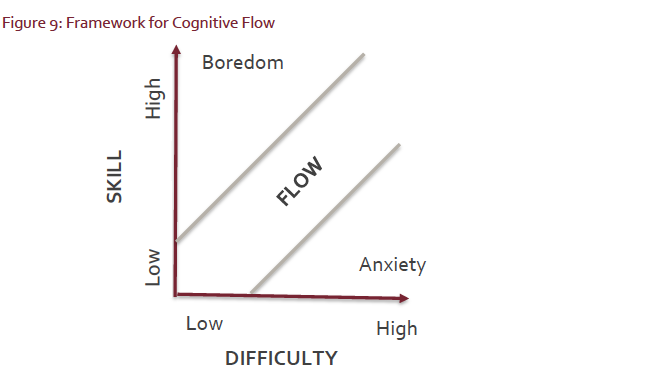 Flow occurs when a task induces complete concentration in pursuing a set of clearly defined goals which deliver immediate feedback upon achievement. Achieving such goals are intrinsically most rewarding when they strike an appropriate balance between difficulty and skill (see Figure 9). Recent academic research3 into game design suggest that social interaction within games enhances “Flow”. The idea of cooperating with others to achieve a complex task in a game appears be more satisfying than achieving a goal in isolation. With Tencent’s hit game, Honor of Kings, players would digitally mingle with their friends while playing the game. Rankings on the game would be broadcast on their WeChat status to create competition between users. The “peer pressure” to have a good score would induce players to advance in the game. This is no different to meeting friends on the basketball court and gaining social esteem through exceptional abilities on the court. Tencent is ideally positioned to leverage this social element which ultimately results in higher user retention and superior game economics. The concept of Flow becomes even more pronounced as games move into the world of eSports. This is because eSports introduces the element of an audience watching the player. China already has an estimated gaming audience of 125 million which is more than double the audience size in the USA. ESports enable Flow by professionalising games through competitive leagues and franchised teams. The reward for reaching the pinnacle of a game becomes lucrative with prize pools as large as USD 5m and sponsorship opportunities. Moreover, skilled players gain satisfaction from broadcasting their gameplay on the Chinese equivalents of Twitch. 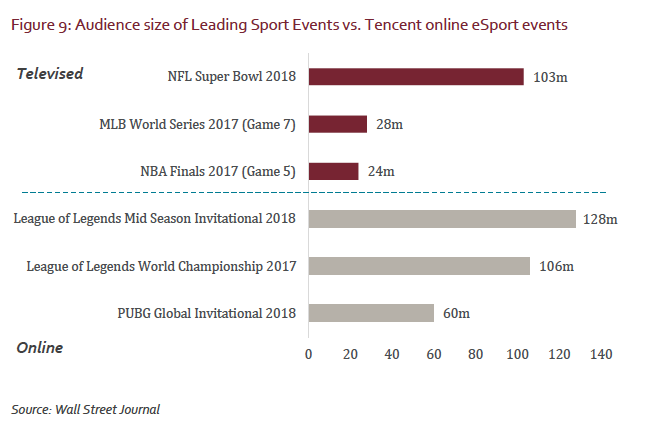 Audiences drawn to eSport competitions rival that of the most popular televised American sporting events and are bound to attract the best (and highest ARPU) gamers to such games (see Figure 8). Tencent’s strategy is to dominate eSports, especially mobile eSports, which will further attract the attention of high ARPU users. China’s tough regulatory stance on censorship of the media industry has historically been more beneficial than negative for dominant companies such as Tencent. The primary benefit has been to restrict foreign competition from entering the market directly thereby forcing them to use local distributors for their content. Online game operators require the following licenses before they can distribute content in China. They are also required to apply for product specific permits before the release of any game. Online publishing permits issued by the National Radio and Television Administration (NRTA) and the General Administration of Press and Publication (GAPP). Historically, item 3 above was issued by a body called the State Administration of Press, Publication, Radio, Film and Television (SAPPRFT). This entity was disbanded in March, 2018 and its responsibilities were allocated to the NRTA and GAPP. The transition appears to have been implemented hastily as the respective authorities were under-resourced upon transition. Furthermore, confusion exists as to which department will ultimately regulate games in the future. GAPP appears to be the leading contender given that it falls under the Communist Party’s Propaganda Department5 . During the confusion, a backlog 2,000 games waiting for approvals was created. The delay affected Tencent more than other developers as its highest potential game at the time did not receive approvals required for game monetisation. The incident demonstrates how regulation can, at times, be negative for Chinese game companies. 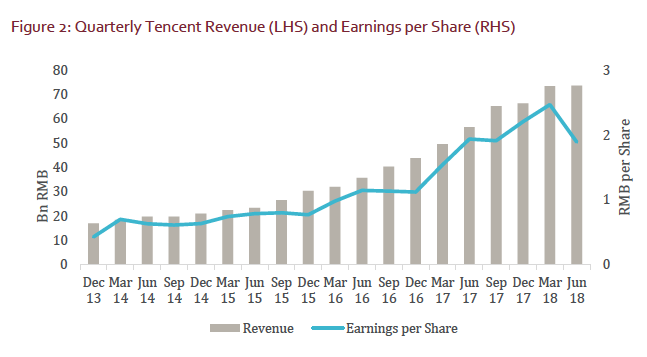 Despite these challenges, Tencent’s financial position remains resilient with a healthy operating margin of 25%, net debt to EBITDA of 0.3x and positive free cash flow. It is easily able to fund its capex and R&D programme. However negative it is that regulators restrict their freedom to release new games and content, it is more negative for smaller competitors than Tencent. Smaller game developers face an existential risk should there be an interruption in their revenue profile due to regulation. Many such developers would be unable to cover operational costs let alone R&D should revenue be delayed for a few months. We therefore believe that a protracted delay in awarding game licenses will ultimately accelerate industry consolidation. We believe that Tencent’s current situation is similar to that of its competitor, NetEase, in 2009. The company tested a grey area within regulation when the right to operate a popular foreign game, World of Warcraft, was transferred to NetEase from a competitor. Even though the game had already been in circulation, regulatory bodies revoked its operating license. A lack of clarity over the process of transferring the license and a turf war between regulatory bodies ultimately led to the relaunch of the game being declared illegal. This caused a severe significant sell-off in the stock price (see Figure 11). This stock price subsequently reverted to its previous high after approval was received later in 2010 based on a negotiated settlement that included NetEase issuing a self-criticism statement for its prior actions. Are the regulatory barriers to entry sustainable? Over time, Tencent has leveraged its favourable industry and regulatory environment to acquire stakes in leading foreign game developers. Such investments are highly complementary as they enable preferential access to leading content which Tencent is able to publish in China. In addition, access to these developers enable transfer of best practices to Tencent’s own game studios in China. A report by Digi-Capital showed that Tencent led or participated in $4 of every $10 invested in games worldwide for the 12 months ending Q1 2018. Today, Tencent is the biggest player in the global game industry by size (see Figure 10) and generates 70% more revenue than the next biggest player. No doubt, the regulatory hurdle placed on entrants to the China game industry has assisted Tencent in building this position in the global industry. It is therefore fair to ask whether the protectionist regulation in China is sustainable given the recent escalation in criticism of such practices by the US under Donald Trump. As far back as 2007, a formal World Trade Organization (WTO) dispute was lodged by the US against China on the basis of denial of market access to products and services in the music, film and publishing industries. Interestingly, US gaming companies did not participate in this dispute possibly for fear of losing favour with Chinese regulators. In our view, it is highly improbably that Chinese authorities will ever allow foreign entities to participate freely in the local media (including games) given their history of actively censoring politically sensitive content. Even instant messaging services need to follow strict censorship rules. Under such a suppressive regime, we do not think authorities will ever be comfortable with a foreign entity having access to sensitive communication in country. 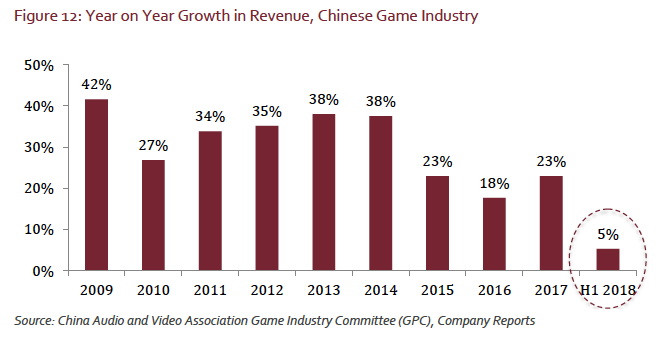 The broader Chinese video game industry has shown a worrying slowdown in growth in 2018 (see Figure 12) due to a restructure of a regulatory body tasked with approving digital games. Once this has been concluded, we expect industry growth rates to revert back to its previous trend. However, the intensification of regulatory scrutiny will most likely drive further interruptions in the revenue profile of the individual game developers or the industry as a whole going forward. The outcome of heightened regulatory action will be to accelerate industry consolidation. Small and medium-size game developers simply do not have the balance sheet strength to sustain their business in the midst of revenue interruptions. Furthermore, the cost of regulatory compliance may become prohibitively expensive for such game developers. For instance, Tencent will be introducing a new system to validate age checks for its video game players which will be linked to the national public security database. This will enable it to ensure compliance with requirements to limit time spent on games by younger children while also allowing parents to monitor activity by their children. Such a system would be unaffordable for smaller developers to create and maintain. Regulators curbing the number of games in operation and potentially even taxing online games create further risks to the sustainability of small developers. The end result is that larger players such as Tencent and NetEase will gain market share from industry consolidation as capital investment leaves the industry. The Chinese game industry as a whole is highly fragmented with as many as 151 listed game developers and more than 80,000 smaller developers in country. Of the 8,000-10,000 games released each year, Tencent and NetEase account for c. 100 games which generate more than half of industry revenue. Tencent’s revenue will certainly be under pressure in the short term due to delays in game monetisation. Ultimately, we expect the decline to be somewhat mitigated by market share gains together with structurally lower customer acquisition costs. 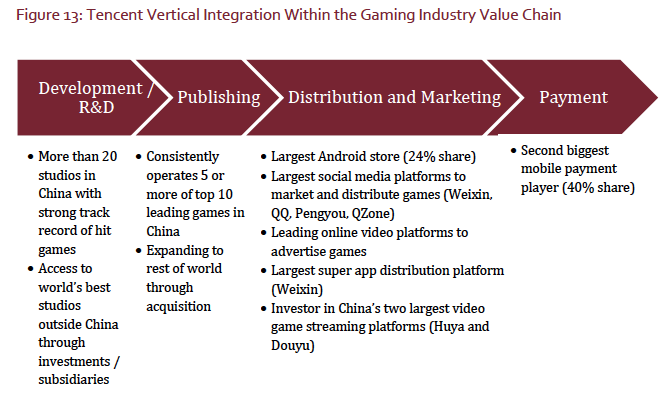 With its strong position across the value chain (see Figure 13), Chinese games will continue to serve as a cash cow for Tencent for a long period of time. Tencent currently deploys excess cash generated from games towards its growing media, international video games, payment and financial services platforms and investments. 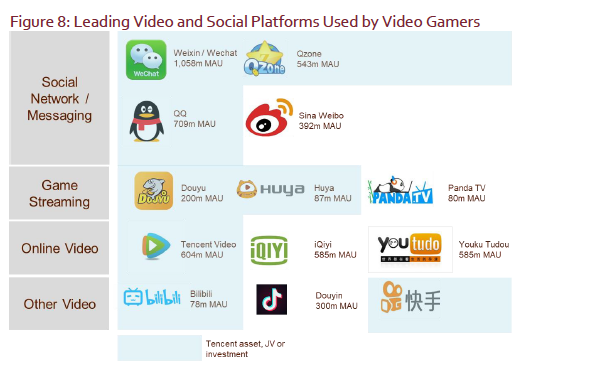 As these strategic areas start to monetise, they will take over from Chinese games as future drivers of growth for Tencent. Of these, selling games developed by Tencent to the rest of the world are showing signs of promise. Their PUBG Mobile game has achieved 100 million downloads internationally (excluding China, Japan and Korea) and is played on over 100 countries. Even if Tencent’s opportunity set within its other value creating segments diminishes over time, the impressive cash flow profile of Tencent (Figure 14) endows it with many degrees of freedom to create further shareholder value. Operating cash flow handsomely exceeds operating capex and dividends paid. This provides significant headroom to reward shareholders with buybacks and dividend growth. The strategy was deployed highly successfully by Apple when growth slowed down in 2016 and 2017. We note with interest that Tencent recently bought back shares in September, 2018. In our opinion, Tencent is far from “game over” and will continue to compound shareholder value into the future. 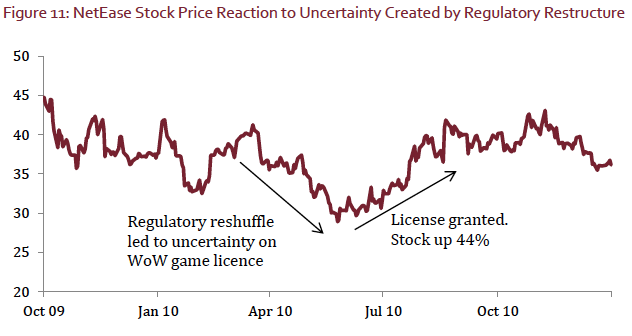 The severe market sell-off in the Tencent stock on the back of regulatory uncertainty has created a potential opportunity for the longterm investor benefit from the extreme negative behavioural bias in the stock price. While regulatory action creates uncertainty over future profits, we believe Tencent is well positioned to navigate the uncertainty and benefit from the resulting industry consolidation.